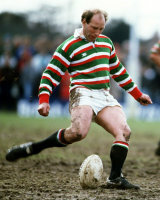 Dusty Hare played for England 25 times as a fullback with a devastating boot, but despite that he was never quite able to secure a regular place in the side in the face of tough opposition. At club level for Nottingham and then Leicester he was never anything other than consistent, and he ended his career with a world record of 7337 points, almost double the previous record held by Sam Doble. He toured once with the British Lions, to New Zealand in 1983, and was also a good enough cricketer to play a few times for Nottinghamshire. While playing rugby he was also a farmer, but he sold the business in 2001 to devite his time to scouting full-time at Leicester.